Due to our location in the heart of the Loch Lomond and Trossachs National Park we are perfect for all types of breaks including walking, biking* (secure storage available), fishing, boating and local Scottish history. We are 1 mile off the West Highland Way, 24 miles from Stirling, 12 miles from Aberfoyle. 1 hours drive from Glasgow and Prestwick airports and Stirling Train station. Whether you come for a one night stay while walking the West Highland Way or stay for a fortnight or more you will leave relaxed, refreshed and inspired at the beauty of the natural surroundings and 360 degree mountain and river views. We are next door to the newly built RSPB gateway visitor center with expert knowledge on all the local wildlife. In spring the sounds of displaying black grouse can be heard from leks only a few hundred metres on the RSPB Inversnaid Reserve. Other sights from here include twite, stonechat, whinchat, wheatear, and the possibility of peregrine, osprey and golden eagle. A short walk takes you down to the Loch side and into the woodland part of the RSPB reserve. Characterised by atlantic oak woodland, here you can expect to see breeding pied flycatcher, redstart, wood warbler and tree pipit. For those interested in bryophytes, lichens and funghi, RSPB Inversnaid offers a mix of important species all year round. Heading east towards Loch Katrine approx 6k is Stronachlacher pier and Pier Cafe perfect for a lunch stop. 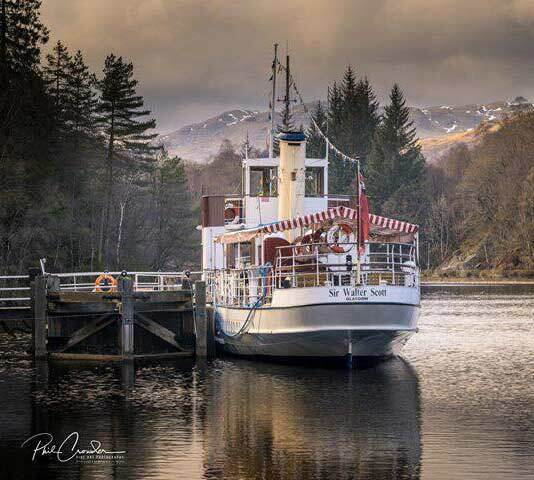 From here you can board the famous Sir Walter Scott steam ship (picture on the leftpicture above) and explore the waters of Loch Katrine while enjoying a drink on board and music on Sundays during the summer months.